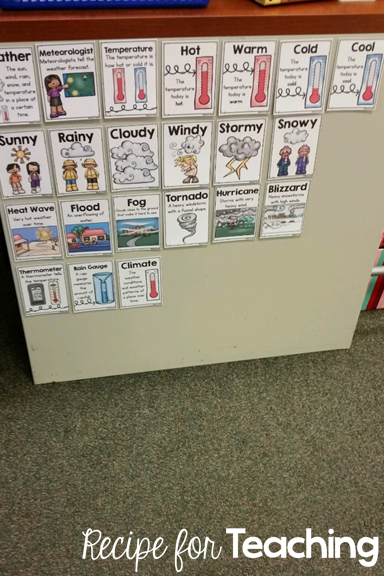 We have been having fun learning all about weather in kindergarten. Weather is all around us. 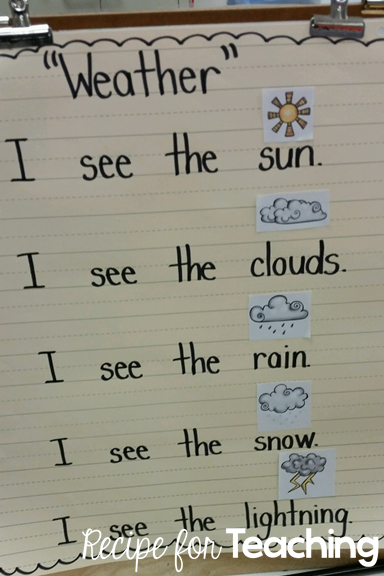 It is something that is easy for young learners to relate to because they can see different types of weather. I wanted to share with you how we are using the Next Generation Science Standards with our students to teach about weather. *recording weather observations in our "Notebook of Learning"
During our calendar routines, we record the morning temperature. Then, in the afternoon, we record the temperature. We do this during our science lesson. I just use the weather channel app to get the temperature. I love that this shows my students how to use technology to help us. 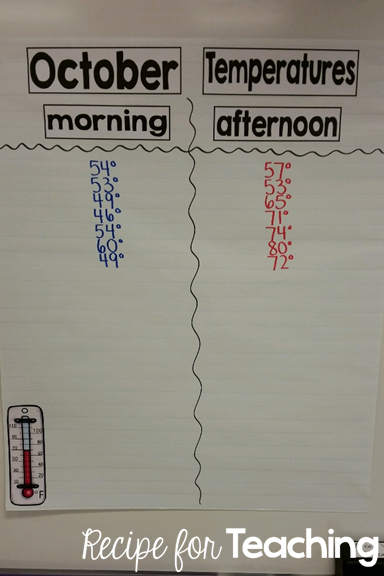 We also keep track of the temperatures on a chart. 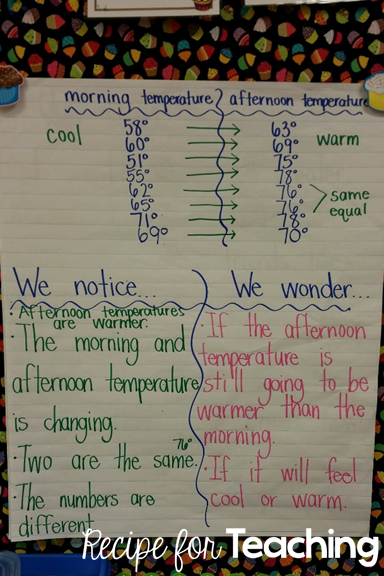 We talk about if the temperature went up or down and what we are noticing about the temperatures in the morning and afternoon. 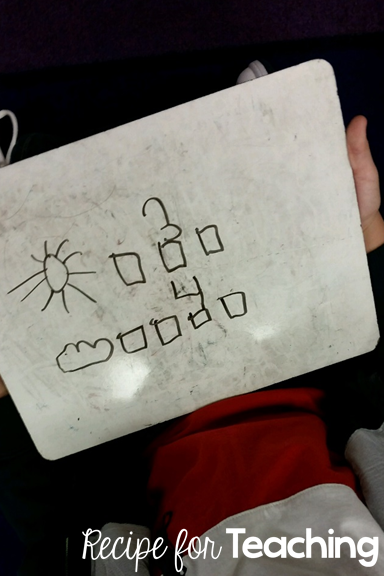 This allows for some really great discussions with my students about the patterns they are noticing with the weather. The first chart is when we started tracking temperature later in September and the second chart is for October temperatures. I made the pieces for this chart as a FREEBIE for you. Just click the image below to grab it! I included the months for the school year, so that you could use it at any point during the year. I have a meteorologist who records the weather on our weather graph each day. We include this as part of our calendar routines. 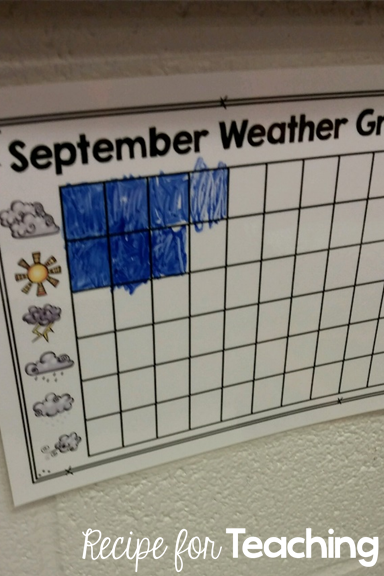 They report the weather to the class and then color a box on our graph. Then we discuss what we notice about the graph. 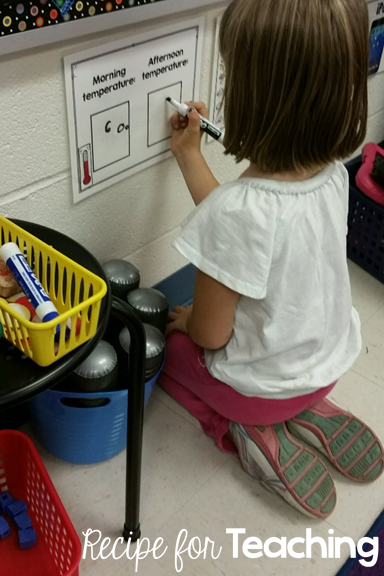 I sometimes have my students get a dry erase board and show a way to record what they see on the graph. 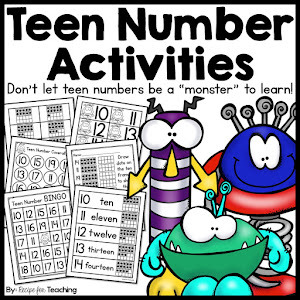 I love how these activities integrate science and math. 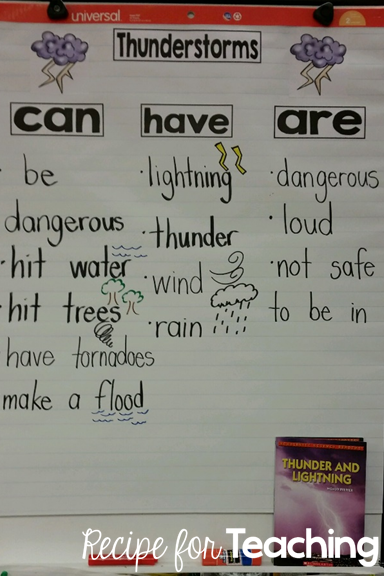 These are some of the weather books we have been reading. I always try to have a mix of fiction and non-fiction for our units. 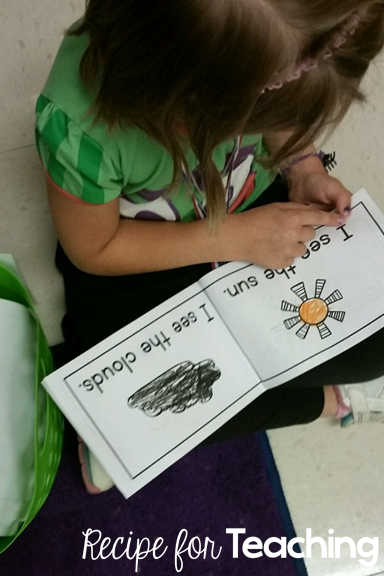 I made this little book, from my Weather Pack, for my students and I also put it on chart paper to read. They put the book in their book baskets for independent reading. 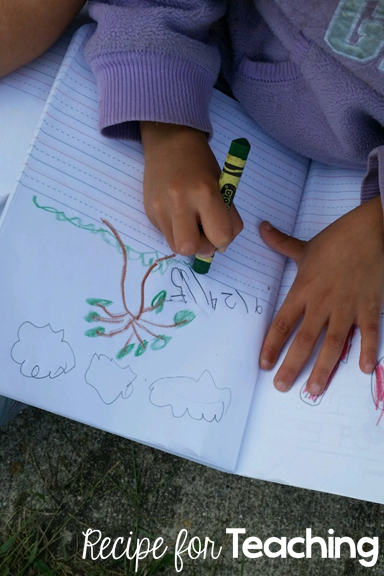 I have talked on my blog before about how I use a Notebook of Learning with my students. We record across all subject areas in this one notebook. 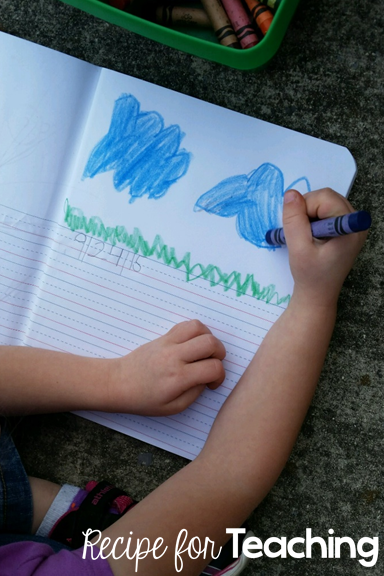 We have been able to go outside and draw the weather in our Notebook of Learning. We also have been noticing that since there is less sunlight outside during fall, the leaves are starting to change color. 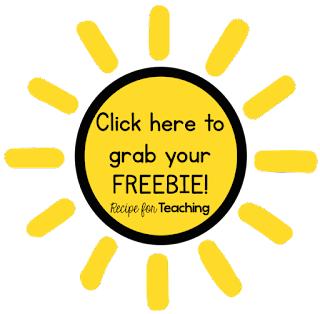 This is an easy way for students to see the effects of the sun on the Earth's surface. 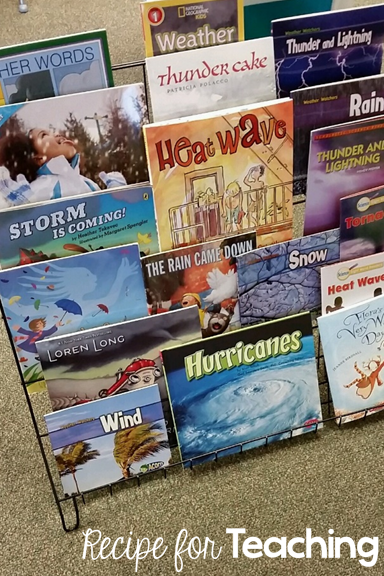 I have a lot of non-fiction books that focus on severe weather. 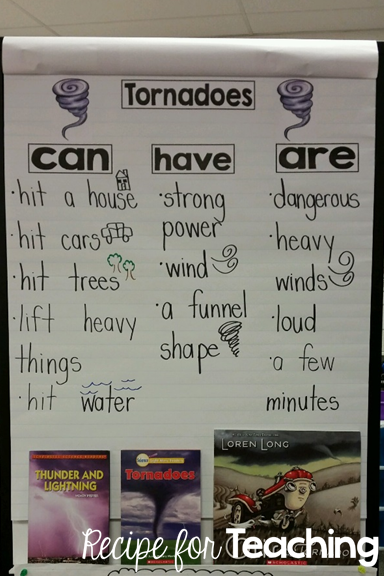 I use those as part of my instruction and then we made a "can/have/are" chart for the different types of severe weather. I made these posters and they are included in my Weather Pack. I printed them 4 to a page, put magnets on the back, and put them on the side of my desk. My students helped me to arrange them and we get the card that matches the weather each morning during calendar. 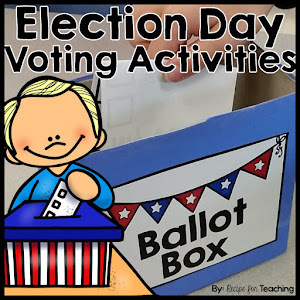 My students can also use them while they are writing. National Geographic Young Explorer is a great online resource. They have the most current issue available online, as well as previous issues. I love this website because it reads the article to students and the articles are very kid friendly. Just click the images to go to the magazine issues online. There is an article about storms in this issue that begins on page 12. On page 19 of this issue you will find an article to read about what happens to a gecko when the sun heats up the sand. The first article in this issue is about rain. This issue has an article on meerkats that fits perfectly with the effects of the sun on the Earth's surface. The article begins on page 16. Page 10 of this issue has a "Weather Watchers" article. 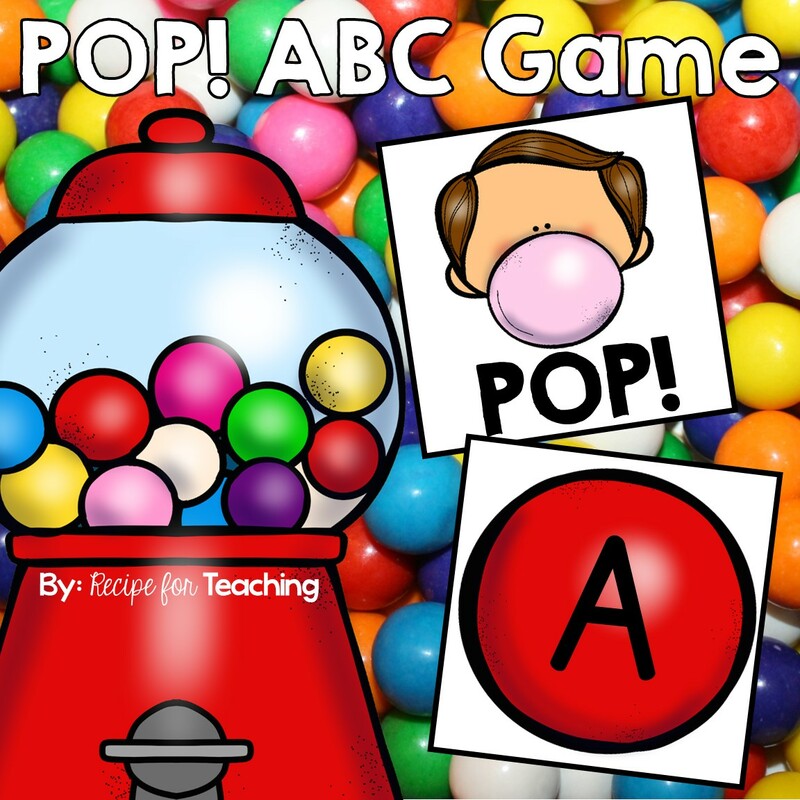 PebbleGo is a great online resource. If you use Next Generation Science Standards, it would definitely be something for you to try to get your school to purchase a subscription for. 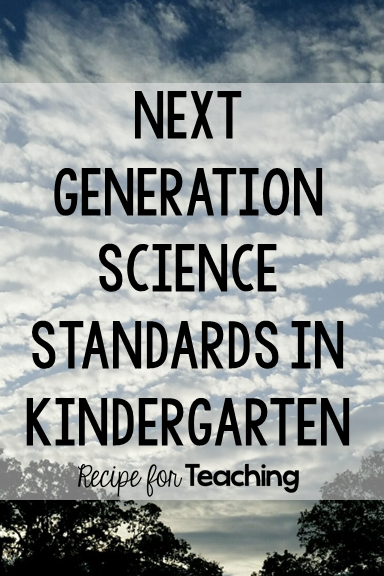 Do you use Next Generation Science Standards with your students? I'd love to hear about it if you are!